The human remains, fragments of markers, and integrity of the original access boundaries are severely threatened by vandalism, desecration, illegal encroachment, and neglect. The clean up effort is essential to remove obstructions into the cemetery, to prevent illegal intrusions, and to establish a plan for proper perpetual maintenance. SAN ANTONIO, October 1, 2018 – A burial ground in Northeast San Antonio, acquired in 1873, was donated to the community by an African American woman named Jane Warren. The cemetery qualifies for protection under the State of Texas Antiquities law and the city of San Antonio historic preservation ordinance. Despite its professed commitment to historic preservation, it appears that San Antonio has never recovered a historic African American site such as this one in its 300-year history. Jane Warren (born in 1825 in Alabama) was a former slave, and matriarch of the Hockley-Freeman-Clay family. She received the deed to the first fifty-seven acres of her land in 1873, and later dedicated 1.26 acres “…to be used as a burying ground and graveyard and a road leading to same…” Records verify burials as early as 1908. Over the years the cemetery became known as the “Hockley Family Cemetery,” although members of several other African American families in the area were also buried there. By 1900 census rolls identified approximately one hundred black residents within a five-mile radius of the Hockley site. The landowners set aside land for “colored church, school and playground” uses in the area. Eventually, the Hockley heirs sold the land, except for the cemetery. Burials continued into the 1970s. In 1980, the Lloyd A. Denton company filed a plat for subdivision of Northern Hills Unit 13 into residential lots north of Uhr Lane. The plat specifically labeled the old Hockley property and easement access as “cemetery” and arranged the new residential lots around the original cemetery boundary. The human remains, fragments of markers, and integrity of the original access boundaries are severely threatened by vandalism, desecration, illegal encroachment, and neglect. The clean-up effort is essential to remove obstructions into the cemetery, to prevent illegal intrusions, and to establish a plan for proper perpetual maintenance. 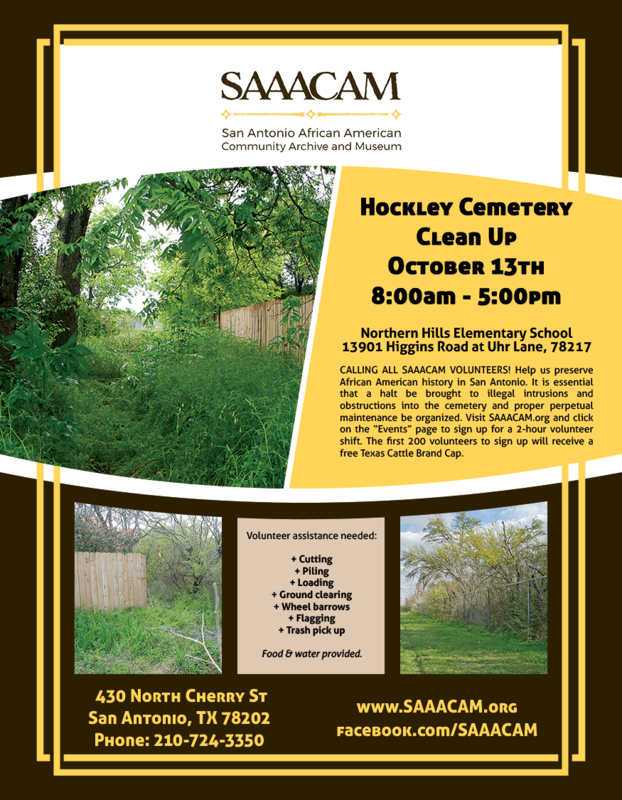 District 10 San Antonio Councilman Clayton Perry has agreed to sponsor a brush removal clean up of the cemetery on Saturday, Oct. 13, 2018. Councilman Perry’s office will provide water and lunch. Kay Hindes, City of San Antonio Archaeologist, and the UTSA Center for Archaeological Research (CAR) have been notified, and will provide on-site guidance. The Texas Nursery and Landscape Association (TNLA, professional contractors) has agreed to provide vehicles and drivers to haul the debris away for proper disposal at no cost. SAAACAM is a 501(c)(3) nonprofit organization formed to collect, maintain, disseminate and interpret authentic African American artifacts, related to San Antonio history, in a community-based digital archive.